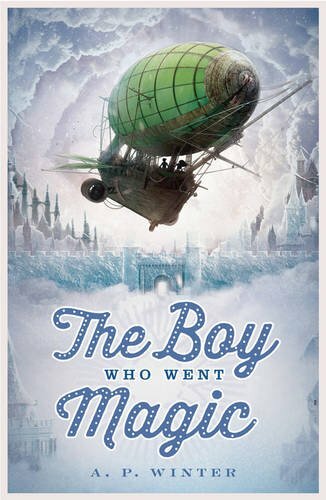 Today, it's great to be interviewing A. P. Winter, debut author of The Boy Who Went Magic, to find out more about him and his writing. This is an amazing magical read that was recently published by Chicken House in June 2017. I send a very warm welcome to A. P Winter - thank you for agreeing to this interview. Let's talk about writing! How do you want your readers to react when they read the first and last page of The Boy Who Went Magic? Really good question. I wanted the opening to tap into the excitement I always felt opening up an adventure story as a kid - that sense that anything might happen - and at the ending. I hope the reader feels they've been on a journey with Bert, with all the bittersweet feelings the end of a good journey brings. This is your debut book. What did you learn from writing it? It is my debut 9-12 novel. I think the most important thing I learned how useful it is to have a good bad guy. Prince Voss didn't exist in early drafts, but once he came to life, it really made a lot of things fall into place. I hear you have a discerning palette for chocolate, does this help you write a good story for children? I don't know about palette, but there are some complementary skills. Chocolate tasting relies heavily on a good memory, specifically a good memory for sensory experiences, and I think that does cross over with what you tap into when you're trying to create an evocative world. Can you remember an early experience where you learned that language had power? I remember making a teacher cry with one of the earliest stories I wrote. It was about a ghost porpoise who'd had a sad life. I actually thought this meant I was in trouble until she explained it was a good thing. I don't really think about it. All my main characters are an amalgamation of people I know and aspects of myself, so I never consider writing 'a woman' or 'a man' - it's more about figuring out who they are and what they want on a character by character basis. Honest answer - tonnes of stuff. I take editing pretty seriously, and there was a lot that got cut and changed to become the novel it is now. My saddest omission was the pirate island. There was a whole middle section of the book where they hang out with some pirates and get into scrapes, but unfortunately, everything that happened there always felt like filler instead of an essential part of the story, and the pirates had to go. The last remnant of them is a couple of comments about how flamboyantly the crew dress on the Professor's ship (they were glam pirates). I miss those guys. Has the city of York inspired any part of this book? I don't want to spoil too much, but York has about two miles of medieval wall that is part of my regular running route - descriptions of one of the key locations in the book are based on the feeling of running there when it's foggy, and you feel like you're up in the clouds. I mean, I said I wasn't going to spoil anything, but that doesn't take much detective work to piece together. There's a castle in the clouds. It's ace. That was York. I love the cover for The Boy Who Went Magic. Do you think that the cover plays an important part in the buying process? Definitely (it also just occurred to me that the castle in the clouds is on the cover, so I don't know what I was thinking there). I was so grateful for Manual Sumberac's art on that cover. I work part-time in a bookshop, so I know how big a difference it makes to stand out from the crowd, especially when it comes to impulse buys - I don't think there's anything like that cover on the shelves. You're hosting a literary dinner party, which particular authors/illustrators would you invite and why? I tend to avoid writers like the plague in real life (obviously with the exception of the lovely people at Chickenhouse, or anyone else I follow on twitter, or work with, or anyone else I may have offended there), but I guess it would be fun to hang out with Cervantes. I love his Don Quixote, and he did a lot of prison time, so I'm pretty sure he'd be excited about whatever I cooked.